“Why, of course,” said the mayor, “who would turn down the King of the land? I hesitated only because I was so shocked. The King has never visited this village, but yes, yes, we would be honored to have him stay here. He is greatly loved in these parts, so yes, by all means, tell him we will look forward to his arrival.” With that, the royal messenger thanked him, turned, and rode off swiftly. The mayor was so excited and so nervous that he did not know where to begin. What an honor, but only a day to prepare! Why, a month would hardly be enough time! He called together his entire staff and all of his servants, issued all sorts of instructions and orders, and soon, everyone in town was hard at work, decorating the banquet hall, preparing the finest food, and cleaning the streets. All the most important people would be invited, and there must be enough food for everyone. All that night and all the next day, everyone raced around, preparing for the arrival of King Edward. By late afternoon they were ready, and the mayor, his wife, and all their important friends stood by the road, waiting to receive the King and his great company of aides and soldiers. The town had never looked better. With the beggar out of sight, the welcoming party resumed their wait. They waited and waited. Minutes passed, then hours, and then it was well past midnight, and still, no King. “Well,” said the mayor, “maybe the King got delayed, and maybe he just decided not to come. Kings can do whatever they want, you know. Maybe he will be here tomorrow.” So they all went home, very sad and disappointed. Meanwhile, William, the servant had taken the shabby beggar down a long winding path, into the forest, and to the little hut of old Jacob, the woodcutter. When they arrived, William explained the situation to Jacob, who graciously accepted the command. So old Jacob and the beggar passed the evening in jolly companionship. The stranger told stories of beautiful lakes and mountains that he had seen, of faraway cities that he had visited, and of strange people and customs that he had encountered. The old wood-cutter had never heard of such things, and his eyes were wide with wonder as they talked long into the night. It was a never to be forgotten evening for Jacob. When morning came and the visitor was about to leave, he handed Jacob an envelope and asked him to give it to the mayor. Thanking Jacob for his hospitality, the shabby man disappeared down the road. Late in the morning, the stranger’s message reached the mayor. What he read left him shaken. It was on the same royally decorated paper as the previous message, and it said: “I wish to express my sincere gratitude for the fine provision of food and lodging, and the generous hospitality of such a fine host. You could not have chosen for me a better companion than Jacob. Perhaps on a later visit I can meet with you.” It was signed, KING EDWARD. This is a story of recognition— or, one should say, of the failure to recognize. The King came to visit, but his appearance was not what the people were expecting, so he was not recognized. The mayor hurried to get him out of the way, and sadly, they never got to meet the King at all. That wonderful, once in a lifetime opportunity was missed. The New Testament also tells the story of the visit of a king to his people, the King of all heaven and earth. This King also came for a visit, but he also did not look like what people were expecting. And he too was shuffled to the side, and then even killed, by those who wanted to get him out of the way. They also failed to recognize the one for whom they were waiting, and they missed the most important of all opportunities. Can there be any more disturbing words in all the Gospel writings? He came to his own, but his own received him not, and not only did they not receive him, they killed him. They were looking for, hoping for, waiting for the promised Messiah from God, but then, when he was right there in their midst, they did not recognize him. He was too ordinary, he was not spectacular enough, he did not fit in with their expectations or their agenda— and they did not recognize him, just like the mayor did not recognize King Edward, who to his eyes looked too ordinary. 2 Corinthians 2:19a — God was in Christ, reconciling the world unto himself. (…meditation on John 6, continued) Yet, Jesus is critical of this desire. He rebukes the people, and although his criticism is gentle enough, he does make it clear that he has come for more important things than to hand out free lunches. In verse 26 Jesus said to the crowd, “I tell you the truth, you are looking for me, not because you saw miraculous signs, but because you ate the loaves and had your fill. Do not work for the food that spoils, but for food that endures to eternal life, which the Son of Man will give you.” And then when they asked him what it is they should be looking for, he offers them the bread of life, that is, eternal life, which can be had by believing in Him. Jesus knew what it was to be hungry– even very hungry. Remember the 40 days in the wilderness that he was without food and was then tempted by the devil? The devil’s very first temptation was to offer a way to get free food. Jesus refused to give in to the temptation, and he stayed hungry. Jesus knew what it was to feel that most basic need. And yet, he knew there was something even more important. When he was hungry, Jesus said to the tempter, “Man does not live on bread alone, but on every word that proceeds from the mouth of God.” One can have plenty to eat here, and still be unhappy. On the average, well fed Americans are less happy than the poor, but cheerful and hopeful Haitians. And, one can have plenty to eat for their whole life, and even be happy for all of life; but this life still comes to an end for the rich as well as for the poor. But even then, that ‘bread of life’ that Jesus was here to offer would still be there and still able to give and sustain even more life, eternal life in heaven. So Jesus said to the crowd, “Do not work for the food that spoils, but for food that endures to eternal life, which I will give you.” Jesus does not mean, of course, that we need not work at all for the food that spoils– our daily work is most of all for the purpose of providing us with that ‘daily bread’ that Jesus himself invited us to pray for in the Lord’s prayer. What Jesus means is to not make the food that spoils or anything that perishes our most important concern. That daily bread, as important as it is, will satisfy us only for a day. But the bread of life will be with us for all eternity. Kay James is an African-American woman who worked in the administration of the first President Bush (see EmailMeditation #458, A Lesson from Mama). She grew up in the ghetto, raised in poverty with her five brothers. Their father had abandoned the family, and the mother worked two, and sometimes three jobs to support them all. They never starved, but they had many meager meals of thin soup and a few crackers. One day, when the mother came home from work, one of the boys had good news. They would be having fried chicken that night, he said, holding up the chicken he had provided. But mama was suspicious. “Where did that chicken come from?,” she asked. After some hemming and hawing, the boy admitted it was stolen from the school kitchen. He and the neighbor boys had gotten away with several. Mama angrily grabbed the chicken by the legs, and the boy took off running because he knew what would be coming next. She hit him on the back with the chicken a couple times before he got away, and then she threw the chicken out the back door for the rats to fight over. Mama said, “We’ll starve before we eat stolen food in this house.” The kids were deeply disappointed, especially since they could smell the fried chicken from the neighbors houses, houses in which other mothers did accept and prepare the stolen food. Looking back, Kay said that it was things like that that kept that family alive. Other boys in the neighborhood got used to taking the easy way out and were soon dealing drugs. Several of them were dead before they were twenty years old from drug overdoses or shootings. But Kay and her brothers learned there was something more important than food, and that was faith in Jesus and the desire to obey him in all things. That deeper, eternal hope gave them the strength to survive even hunger. Let also, Lord, our souls be fed. Sustain us on our homeward way. Amen. Some time after this, Jesus crossed to the far shore of the Sea of Galilee, and a great crowd of people followed him because they saw the signs he had performed by healing the sick. Then Jesus went up on a mountainside and sat down with his disciples. The Jewish Passover Festival was near. Actually, Snoopy had the biggest worry of all. One of the most basic needs, for humans and for dogs, is to eat, and after a day or two of no food, hunger will begin to override all other concerns. Charlie Brown was feeling the burden of all the trouble in the world, and, as readers of that comic strip can well remember, he also had a lot of personal problems. But if no one fed him for a couple days, all other worries would be forgotten, and like Snoopy, he would be thinking and worrying about nothing but food. When I traveled in Haiti with a missionary several years ago, I met many people who were often hungry. For them, happiness in life was a simple matter– if they got something to eat on any given day, that was a happy day, and if they didn’t eat, well then, that was a tough day; but maybe the next day would be better. They had that simple hope. I did not meet anyone who was starving to death. The people I met could scrape together enough to live. But it was not uncommon for them to go with no food at all for a day, or two, or even three days. The missionary I was with told me that suicide and even depression were rare among the poor in Haiti. Happiness for them was a simple matter, and not nearly so complicated as it is for people who have so much of everything. When you have something to eat, then you can begin to worry about finding shelter, getting yourself more comfortable, finding something fun and entertaining to do on the weekends, buying a better TV set, remodeling the house, and so on. But if the grocery store shelves were all of a sudden emptied, and you would not be able to get any food anywhere, all those other concerns would be quickly forgotten. Hunger can make you forget almost everything else. Father in heaven, sustain our bodies with this food, our hearts with true friendship, and our souls with Thy truth, for Christ’s sake. Amen. Lord Jesus, you are the living water given to quench the deepest thirst of our hearts and you are the bread of heaven sent to give us life that will go on forever. We thank you that you are also mindful of our earthly human needs and that day by day you provide for these needs, even as you give us the gifts we need for our spirits. We praise and thank you. Amen. Good morning, Heavenly Father; good morning, Lord Jesus; good morning, Holy Spirit. Heavenly Father, I worship you, creator and sustainer of the universe. Lord Jesus, I worship you, Savior and Lord of the world. Holy Spirit, I worship you, sanctifier of the people of God. Glory to the Father, and to the Son, and to the Holy Spirit; as it was in the beginning, is now, and will be forever. Heavenly Father, I pray that I may live this day in your presence and please you more and more. Lord Jesus, I pray that this day I may take up my cross and follow you. Holy Spirit, I pray that this day you will fill me with yourself and cause your fruit to ripen in my life: love, joy, peace, patience, kindness, goodness, faithfulness, gentleness, and self-control. Holy, blessed, and glorious Trinity, three persons in one God, have mercy upon me. Amen. John Stott was an Anglican priest, and for many decades, a leader in the worldwide Evangelical movement. Stott prayed this prayer every morning for much of his life. The prayer address all three persons of the Trinity, emphasizing this central Christian understanding of God. I like the familiarity with which God is addressed (‘good morning!’), and yet the focus is on reverent praise for God’s almighty majesty as Creator, Savior, and Sanctifier. The prayer also includes requests for the faith and ability to live better, more obedient, lives, and, a plea for mercy for our inevitable failures. It is a wonderful prayer and it has become a part of my own daily morning prayers. In a world that is getting ever darker, we thank you for the light of Christ. Lord, I shall be verie busy this day. I may forget Thee, but do not forget me. before the battle of Edgehill in the English Civil War. Yet let me never think, 0 eternal Father, that I am here to stay. Let me still remember that I am a stranger and pilgrim on the earth. For here we have no continuing city, but we seek one to come. Preserve me by Thy grace, good Lord, from so losing myself in the joys of earth that I may have no longing left for the purer joys of heaven. Let not the happiness of this day become a snare to my too worldly heart. And if, instead of happiness, I have to-day suffered any disappointment or defeat, if there has been any sorrow where I had hoped for joy, or sickness where I had looked for health, give me grace to accept it from Thy hand as a loving reminder that this is not my home. This prayer is from a prayer book I use every morning for my daily devotions: A Diary of Private Prayer by Scottish pastor and theologian John Baillie (1886-1960). This devotional classic contains a one page prayer for every morning and evening of the month. The above prayer is for the evening of the 21st day. It is a most wonderful prayer, beginning with gratitude for this day, this world, and this life. The prayer then lifts our thoughts to a remembrance of God’s promise of an eternal life in his home, and reminds us to see our current sufferings in the light of that eternal hope. The prayer then ends as it began, with gratitude, this time giving thanks for our home in eternity. The Bible itself contains many wonderful prayers. Here are just a few of the shorter ones. These can be easily memorized and prayed anytime during the day or night. Some would consider this morbid or inappropriate. But why? Mortality is a fact of life. What do we gain– and what do our children gain– if we pretend it isn’t? I’m going to die. So are you. So are our children. We don’t know when, but we do know it will happen– unless, of course, Christ returns in our lifetime. He will return, but throughout the centuries He hasn’t yet, even though countless people believed that He would return before they died. How many children– whether ten years old or forty– have been traumatized by the sudden loss of a parent? When Dad and Mom speak openly of this possibility, it’s a gift to their children. If Christian parents remind their Christian children that the worst that can happen in death is temporary separation, it’s reassuring. Their relationship cannot be terminated, only interrupted. What will eventually follow– whether in hours, days, years, or decades in the future– is a great reunion, wonderful beyond imagination. Ancient merchants often wrote the words memento mori— “remember death”– in large letters on the first page of their accounting books. Philip of Macedon, father of Alexander the Great, commissioned a servant to stand in his presence each day and say, “Philip, remember you will die.” In contrast, France’s Louis XIV decreed that the word death not be uttered in his presence. Most of us are more like Louis than Philip, denying death and avoiding the thought of it except when it’s forced upon us. We live under the fear of death. Jesus came to deliver us from the fear of death, “so that by his death he might destroy him who holds the power of death– that is, the devil– and free those who all their lives were held in slavery by their fear of death” (Hebrews 2:14-15). In light of the coming resurrection of the dead, the apostle Paul asks, “Where, O death, is your victory? Where, O death, is your sting?” (1 Corinthians 15:55). What delivers us from the fear of death? What takes away death’s sting? Only a relationship with the Person who died on our behalf, the One who has gone ahead to make a place for us to live with Him. It’s neither morbid nor inappropriate to speak of such things with your family. Denial of truth, not truth itself, is the breeding ground for anxiety. One of the greatest gifts you can bestow on your loved ones is the honest anticipation of reunion in the better world, the one for which we were made. We should familiarize ourselves with death during our lifetime, inviting death into our presence when it is still at a distance… You must look at death while you are alive, but see it in the light of Christ and grace and heaven, permitting nothing to divert you from that view… If you look at death in any other way, it will kill you with great anxiety and anguish. This is why Christ says, “In the world– (that is, in yourselves)– you have unrest, but in me you will find peace” (John 16:33). Psalm 39:4 — Show me, Lord, my life’s end and the number of my days; let me know how fleeting my life is. Ecclesiastes 2:11 — Yet when I surveyed all that my hands had done and what I had toiled to achieve, everything was meaningless, a chasing after the wind; nothing was gained under the sun. –Prayer based on Martin Luther’s catechism explanation of the first commandment. 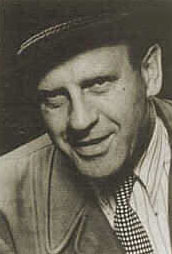 Oskar Schindler was a German businessman in the 1930’s. In many ways he was a most despicable man. He did not like Adolph Hitler, but eagerly joined the Nazi party when he saw that it could be very good for business. He was raised a Catholic, but never went to church unless he needed to make a business contact there. He spent more money on alcohol than most people will spend in a lifetime on everything. He was a heavy drinker himself, he threw many parties, bought many rounds, and gave away countless expensive cases of wine as he sought to gain favor with Nazi military and political leaders. And when the war began Schindler was able to secure several lucrative industrial contracts, and became extremely wealthy. His businesses were especially profitable because he had to pay very little for labor. He set up his plant near a neighborhood in Poland where Jews had been imprisoned by the Nazis, and he paid the Jewish refugees practically nothing. Schindler was a domineering man, and could get his way with anyone, Jewish refugee or high-ranking Nazi, by doing whatever it took. He would bully and he would charm, he would threaten and he would bribe, at times he would intimidate people and at other times he would endear himself to them. After the war, Schindler’s luck ran out. He had to flee because he was branded a war criminal for illegal profiteering and for using Jewish slave labor. He went to Argentina with his wife and one of his many mistresses. Schindler had a wonderful wife, but carried on numerous affairs without even trying to hide it from her. In Argentina, his marriage ended to the surprise of no one, and he also failed at everything else he tried there. Near the end of his life, he moved back to Germany where was despised by many of his neighbors because of his wartime activities. He died in 1974. Despite all that, Oskar Schindler was buried with honor in the Catholic cemetery in Jerusalem. He had said, ‘Bury me in the Holy City among my people.’ He was declared by Jewish leaders a ‘righteous man.’ In 1993 Steven Spielberg, a Jew, made a movie about his wartime activities called Schindler’s List which won the academy award for the best movie of that year. You see, along with all his huge faults and sins, there is one part of Oskar Schindler’s story that I have not yet described. 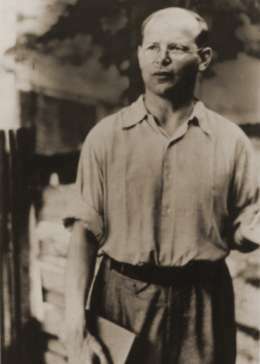 Oscar Schindler saved the lives of more condemned Jews in World War II than any other individual. In 1943 all the workers in Schindler’s Poland plants were ordered to go to the concentration camp in Auschwitz, that death camp which was killing and cremating thousands of Jews each and every day. Schindler had by this time already made more money than he would ever need. He could have left the country, bought a mansion somewhere, and lived out his days in luxury. But somewhere along the line something happened to Oskar Schindler, something that was never understood by even those who knew him best. For some reason, he began to care about those Jews who were to him at first nothing but cheap labor. Schindler demanded that ‘my Jews’ (as he called them) not be sent to Auschwitz, but that they be permitted to stay to run his plants. The Nazis refused. So he bribed them, arriving at a price in the thousands of dollars for each Jew he wanted to save. The Jews he would buy would then be loaded into a train going the opposite direction of Auschwitz, to work in another factory he bought in Czechoslovakia. Thus began the task of making up ‘Schindler’s List’ of those Jews who he would buy and thereby save from the gas chambers. The movie shows him adding name after name to the list, with each name depleting his fortune, until there were over 1200 names on the list. The bribed Nazis kept their word, and the Jews were taken to Schindler’s factory. They were still heavily guarded by German soldiers, but Schindler treated them as well as he could. He kept them all alive and fed and working until the end of the war. In Jesus’ parable of the Last Judgment in Matthew 25, ‘all the nations of the world’ are gathered before him. The people are divided into two groups, and to each group, Jesus says, “I was hungry and you did (or did not) feed me, I was thirsty, and you did (or did not) help me, I was imprisoned and you did (or did not) come to me,” and so on. This parable of Jesus is intended to give us a long term perspective on our good deeds. When on that last day we stand before the Lord we will be happy for every good deed done, but we will sorely regret the many times we had the opportunity to do good and neglected to do so. At the moment of decision, helping someone in need may seem to be a costly and an unwanted interruption, but than later on, we usually do feel good about helping. In the same way, later on, we may feel guilty about not giving someone a hand when we could have. How much more so, implies Jesus, after your life is over and all opportunities are past, will we have those good feelings or those regrets. Paraphrasing Martin Luther: “When we are brought to life on the last day we shall spit on ourselves and say, ‘Shame on you for not bring bolder in obeying Christ when you had the chance, since the glory is so great'” (Table Talk #203). Who can tell what a day may bring forth? Cause me therefore, gracious God, to live every day as if it were to be my last, for I know not that it may be such. Cause me to live now as I shall wish I had done when I come to die. O grant that when I die I may be found in Christ, who is my only Savior and Redeemer. Amen. This verse is in the middle of Matthew’s account of Pontius Pilate’s questioning of Jesus. There is no recorded response of Pilate to this message. He is already convinced that Jesus is innocent, and he is trying to get him released. However, when he does give in to the pressure being exerted on him and does agree to allow Jesus to be crucified, he asks for a bowl of water so he could ‘wash his hands’ of the whole affair. Was this perhaps at least an attempt to abide by his wife’s wishes? Maybe, maybe not. There is no direct link between this verse and any other verse in Matthew or in any other part of the Bible. Pilates’ wife and her dream are nowhere else mentioned. But this is an interesting little verse. First of all, where did it come from? How did Matthew, writing his Gospel several years after these events, find out about that dream and this private message to Pilate from his wife during the trial? Pilate served in Judea only a few more years, and even while he was there, it would have been unlikely that the Roman governor’s wife would have anything to do with this band of disciples of a country preacher. That is, unless she sought them out; and there is some evidence that perhaps she did. Pilate’s wife is not named in the Bible, nor is she even mentioned anywhere else in the Biblical record. But she is mentioned several times in other early Christian literature. In these writings it is said that her name was Procula (or sometimes Claudia, or, Procula Claudia), and in those other old documents, there are accounts of her conversion to Christianity. Not only that, but she seems to be important enough to be declared a saint in the Eastern Orthodox Church. There is also some evidence that she might have been persecuted for her faith and died a martyr. The collected writings from these early years of the church fill many volumes, and some are more accurate than others. Legends have crept into many of them. But there is reason to believe that these accounts of Pilate’s wife becoming a Christian are true. One of the big reasons to believe that Procula did become a Christian is the presence of this little verse. It was a private message from a wife to her husband. It is not the sort of thing that Pilate would have wanted known. When Ronald Reagan was president it was reported that his wife Nancy had some interest in astrology. Critics wondered if she was influencing the president with that nonsense, and if national policy was being directed by the stars in the sky. This is not the kind of publicity that a politician wants. 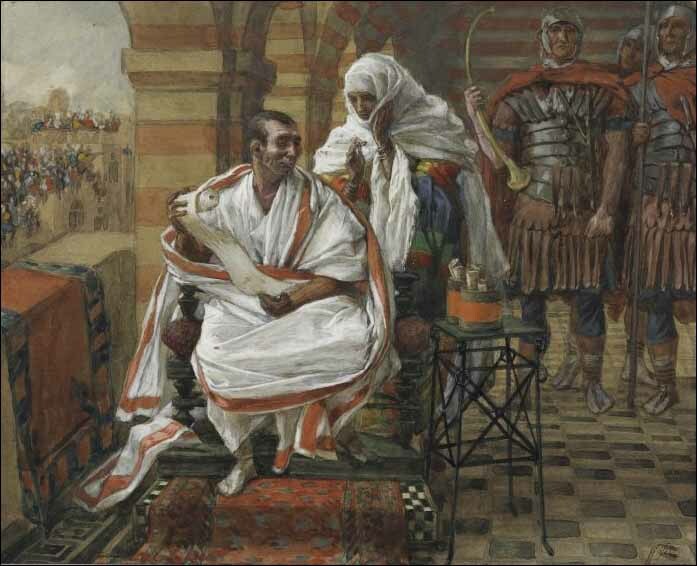 Pilate would not have wanted it known that while he was on the judge’s seat deciding a case of capital punishment, his wife was sending him instructions based on her dreams. The religious leaders already had him in a tough spot with Jesus. He certainly did not need this additional embarrassment. However, if years later Pilate’s wife did become a Christian, she certainly would have been a celebrity in the early Christian community, and her story would have been of great interest and widely circulated. Under those circumstances, it is very easy to imagine Matthew learning of that dream and including it in his Gospel. The brief verse tells us nothing of the source of Procula’s dream, but there are two possibilities. First of all, it might have come directly from God. That happens in the Bible, and I don’t doubt that it still happens. But this doesn’t happen very often in the Bible, and I don’t think it happens to many people today. And without a clear sign that some dream or inner voice is from God, it is best to assume that it is not. Without a single word about divine revelation in this verse, it is best to assume the second possibility, that the dream came to her the natural way. When dreams come to you in the usual way, you have to have some previous knowledge of what you are dreaming about. Pilate’s wife, therefore, must have heard something about Jesus. Perhaps she had heard about his ministry for three years already; teaching large crowds, healing many people of all sorts of ailments, and even raising the dead. Perhaps she had taken an interest in the incredible work of this holy man. Somehow, Procula had heard enough to form an opinion about Jesus, for when she sent that message to her husband she said, “Have nothing to do with that innocent man.” Innocent. Well, that is exactly what the chief priests, and then Pilate, had been spending the last few hours trying to decide– whether Jesus was innocent or guilty. But Procula’s mind was already made up. “Have nothing to do with that innocent man,” she said. We see in this single verse just a hint of the impact Jesus was beginning to have. In the previous months, the crowds following Jesus had been in the thousands. By the time of the trial, the crowds were gone. Only the disciples and a few women remained, and most of them had deserted Jesus. When Jesus rose from the dead, his closest followers returned, and then many others came back; and then on Pentecost Day, the number of believers in Jesus again grew into the thousands. Then, within just a few generations, it is estimated that well over half of the people living in the Roman empire believed in Jesus as Lord. Pilate’s wife was perhaps one of the very first. She was at the very least fascinated by him and deeply disturbed that her husband might condemn him. Think of what she felt when Pilate came home for supper and said that Jesus was on the cross. And think of what she must have thought when the report came on Sunday morning that the tomb was empty, and people had reported seeing Jesus. It seems to me that those accounts of Procula becoming a Christian could very well be true. In time, a majority of the Romans would believe that Jesus, and not Caesar, was Lord. Colossians 3:11-12 — Here there is no Gentile or Jew, circumcised or uncircumcised, barbarian, Scythian, slave or free, but Christ is all, and is in all. Therefore, as God’s chosen people, holy and dearly loved, clothe yourselves with compassion, kindness, humility, gentleness and patience. Long before there was a war in Vietnam, there were Christian missionaries proclaiming the Gospel to the Vietnamese. The Christian population of Vietnam was never very large, and it has been severely persecuted since the end of the Vietnam war, but those who have persisted have grown strong in the faith. Hien Pham was a Vietnamese Christian who worked as a translator for the missionaries in the 1960’s and 70’s during the war. After Vietnam fell, Hien was captured by the Viet Cong and imprisoned. He was accused of collaborating with the CIA, and while in prison he was to be re-educated. He was taught about the evils of democracy and the many benefits of communism. He was also told that he had been brainwashed by the Christians, and that there really was no God. The authorities took away the Bible that he loved and forbade him to speak English, the language that he loved. “There is no such thing as God,” was the message that his captors drilled in, day after hellish day. The next morning, Hien, the newest atheist in the camp, stood in line as the commanding officer of the prison barked out the assignments for the day. Hien’s job that day was to clean the latrines. He cringed when he heard it. This was the ultimate form of indignity for the prisoners. The latrines were shabby and filthy and Hien would be spending the entire day amidst that filth. The soiled toilet paper was not flushed through the primitive plumbing, but was put into waste baskets. One of Hien’s last jobs of the day was to empty these waste baskets. All day long he had labored with reminders to reinforce his new belief that there is no God. How indeed could a loving God leave him here and not rescue him from this living hell? But as Hien’s work for the day was coming to an end, something in the last trash can happened to catch his eye. It was a piece of paper with printed type. As Hien looked closer, he saw it was in English. Anxious to read this language once again, he looked around to make sure no one was watching. He then quickly rinsed off the filth and tucked the paper into his pocket. Hien began to cry. Of all the Scripture verses he had known, these were the ones he most needed to hear in his present situation, and now they had come back to him in a most incredible way. “Lord,” he prayed, “you would not let me out of your reach for even one day.” Hien then gave up the atheism that he had just embraced, and went back to his faith and his daily prayers. Hien did not know it in the beginning, but it was that officer himself who had been tearing out pages from a confiscated Bible and using them for toilet paper. Now, each day, Hien would find more pages, and each day, he would rinse them clean, hide them in his pocket, and read them at night. In this way his faith was sustained and strengthened. Life seemed hopeless to Hien as he cleaned those prison camp latrines, but there among the filth he found a word of hope. Romans 8:24-5 — For in this hope we were saved. But hope that is seen is no hope at all. Who hopes for what they already have? But if we hope for what we do not yet have, we wait for it patiently. My God, I believe in you. Increase my faith. My God, I hope in you. Strengthen my hope.